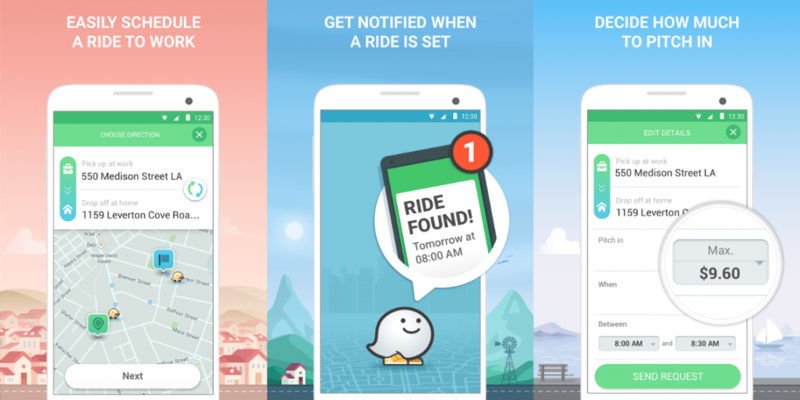 Google has quietly begun rolling out its Waze ride-sharing service to users in the San Francisco Bay Area, following a pilot program that was initially available to more than 25,000 employees at select companies such as Adobe and Walmart. The service puts Google in competition with Uber’s UberPool and Lyft’s Line services, but with some key differences in the business model. While the aforementioned Uber and Lyft services are basically swapouts for taxis that let you split the cost of your trip with another rider headed in the same direction, Google said it intends to have the Waze app match drivers and riders already looking to move in the same direction. The driver is only reimbursed for mileage driven at a maximum of 54 cents per mile — Google says it doesn't believe drivers need to report any payment as income because it is considered gas money. Coordination, communication, and payment are automatically handled through the mobile apps. According to an account by a Wall Street Journal reporter taking a trip from San Francisco’s financial district to Oakland — roughly a 20-minute ride — Google paid the driver $6.30 and charged the rider just $3 — factoring in a discount for the service’s launch. The same ride outside of rush hour would cost $23 to $30 on Uber or Lyft, according to the companies’ apps. Those in the San Francisco Bay Area can register via the original Waze app, but riders must make requests via the separate Waze Rider app. For now at least, drivers aren't subject to a background check, nor are they required to provide a photo ID, they are just required to provide Waze with a schedule overview in addition to their home and work addresses.